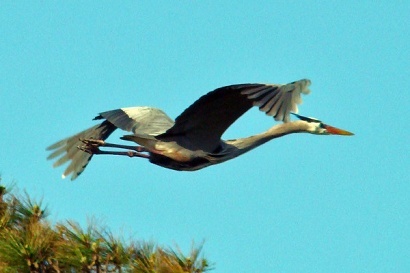 Knowing how frantic bird activity can be near sundown we hurried to our bay house and unloaded. Back to our gas station to photograph the activity I set up my equipment for an hour or more shoot. For that I use a battery powered inverter to connect to my camera�s ac power supply. A continuous supply of power allows you to concentrate on photography without worry that the camera would time out. The nests are in the very top of these 70 foot tall trees. 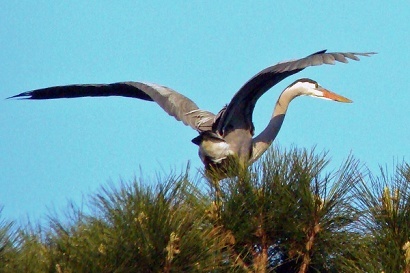 This makes selecting the magnification of the lens simply the same for the nest and incoming bird altitude. I choose a shutter speed of 1/2000 and let the camera choose the aperture for proper exposure. 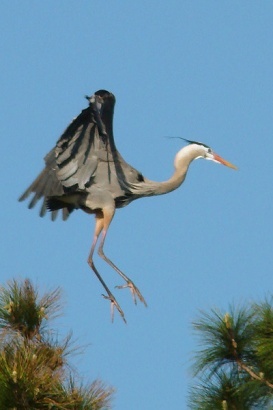 These selections make interesting flying heron photos relatively easy. We shot photos until I saw the red light of sundown say ��Enough�. The only unexpected events were the people who walk up and either wants to ask what is happening or to tell you facts they know. 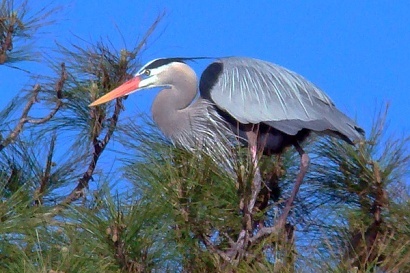 Most people want to know what kind of bird this is, but one person wanted to tell us the herons have nested in these trees for three years now. 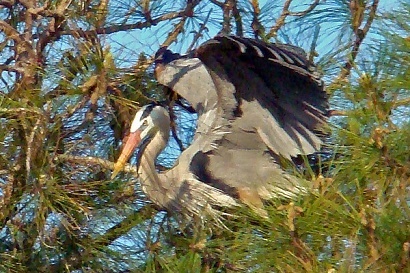 We had tried to photograph nesting herons at Paradise Pond at Port Aransas maybe five years ago. This was one of the last years that the Pond had water in it. We don�t know what has caused the Pond water to dry up. The visitor�s board walkway was level with the bird nests at Paradise Pond, but the lighting made good photos difficult. 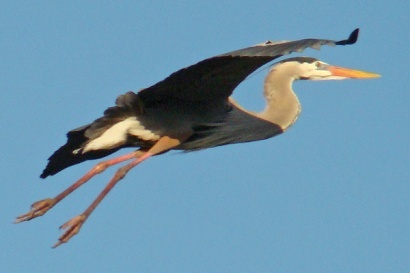 Frankly I have never got a heron photo worthy of publishing at this site which is only about 10 flying miles from Rockport. But if it is dragonflies and turtles you are interested in � this WAS the place. But without water there is little of interest. 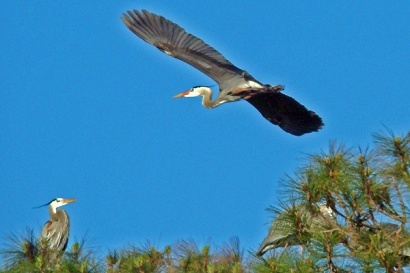 Nests are of interest to other birds such as sea gulls and hawks which can be circling overhead. They look for opportunities to rob eggs or take other advantage. 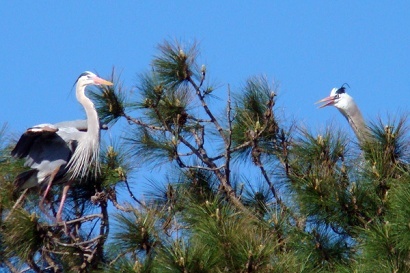 All this heron activity is relatively quiet. 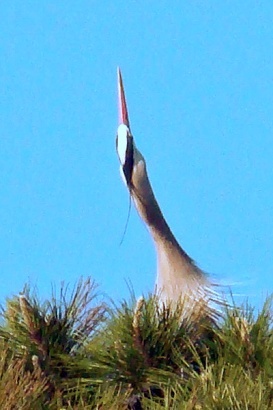 Only a few squawks are heard when some discord occurs. 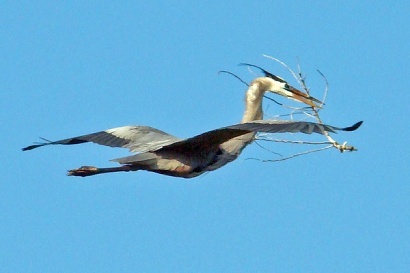 Just because a male bird brings nest building material does not mean the female bird will accept it. In that case the male does not just drop the material. Often I have seen them approach other nests which usually reject him and the material too. 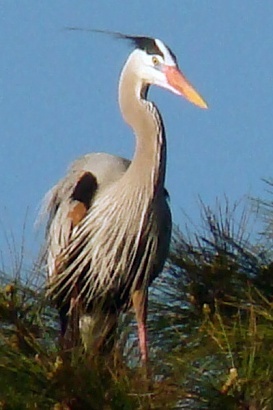 A typical heron stands four feet high with a six foot wing span. 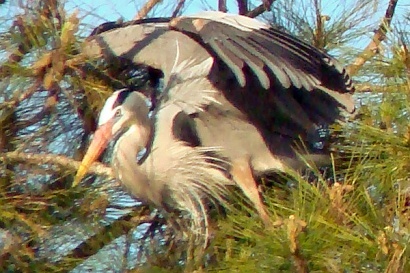 When they land in the top of a pine tree folding their wings looks as awkward as a person folding an umbrella getting in a car. 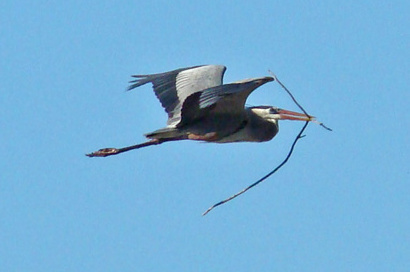 Here the nest building material comes from inland. 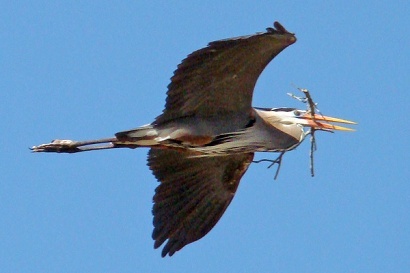 The female bird also needs to be fed since they will not leave the nest. Food in this case would come from Little Bay. Once the egg(s) are in the nest one of the birds will sit on the nest to protect the eggs continuously.